GBFRM10 Antique White; Mill Hill; Frames - Mill Hill; Solid Color Wooden Frames; Front opening 5.5" x 5.5"
MH140105 Nautilus Shell (2010); Mill Hill; Buttons and Bead Kits; Spring Series; Beads,ceramic button, perforated paper, floss, needles, chart and instructions. 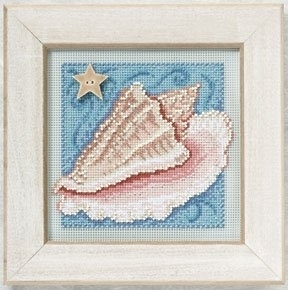 Mill Hill frame GBFRM10 sold separately ; 5" x 5"
MH141612 Sand Dollar (2016); Mill Hill; Buttons and Bead Kits; Spring Series; Beads,ceramic button, perforated paper, floss, needles, chart and instructions. MH141615 Starfish (2016); Mill Hill; Buttons and Bead Kits; Spring Series; Beads,ceramic button, perforated paper, floss, needles, chart and instructions. Mill Hill frame GBFRM10 sold separately ; 5" x 4.5"
MH141811 Crab (2018); Mill Hill; Buttons and Bead Kits; Spring Series; Beads,ceramic button, perforated paper, floss, needles, chart and instructions. Mill Hill frame GBFRM8 sold separately ; 4.75" X 4.75"
MH141813 Seahorse (2018); Mill Hill; Buttons and Bead Kits; Spring Series; Beads,ceramic button, perforated paper, floss, needles, chart and instructions.